Skopelos traditional recipes unveil lots of delicious treats, such as loukoumades (honey dumplings). Loukoumades are popular all around the Mediterranean region and especially in Greece. Always homemade, they are small bites of heaven that will delight your sweet tooth instantly. 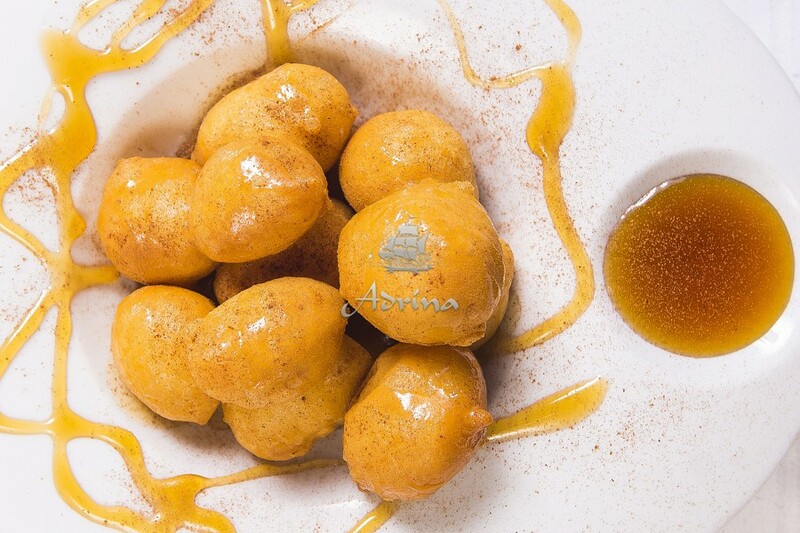 The traditional recipe mixes the loukoumades with honey and cinnamon, yet new versions come out the local chefs’ kitchens constantly. If you have the chance to taste a new local dessert, then Loukoumades must be it. Take a look on our exciting, extra cool version and get the best out of Skopelos traditional recipes! We peel the potatoes, we boil them and when ready we mash them in a bowl. In another bowl we place flour and salt, adding sugar and yeast, while whisking the ingredients continuously. In the same bowl we add the mashed potatoes, an egg, a bit of ouzo and some water, stirring the ingredients constantly. We allow the dough to rise for a couple of hours. Then, in a heated frying pan we pour extra virgin olive oil and we place the mixture (one spoon of dough equals one loukouma). We fry for 3 minutes. When fried, we place loukoumades on a serving plate, top them with honey and nuts. Loukoumades is a must for all Skopelos first-time explorers since it is a totally different taste than anything you have ever tasted. Order it today at the local pastry shops or restaurants to truly capture the magnificence of Skopelos traditional recipes.